The Funky Felter: Yay! 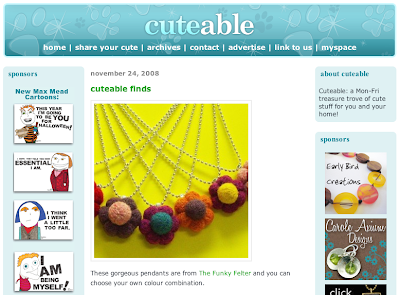 My needle felted flower pendants have been featured on Cuteable! Yay! My needle felted flower pendants have been featured on Cuteable! I got a little email yesterday from Lynsey at Cuteable. It was letting me know that my needle felted flower pendants were being featured in a post. I am honored and thrilled! Thanks so much to Lynsey! If you regularly stop by my blog, you've probably seen me post a few times by now about one of my felted goodies being featured somewhere. You may be wondering how to get your lovely handcrafted items noticed and featured. There's a great article over at Modish about contacting blogs to submit your work. It is a must read in my opinion and is very well written. That is actually where I got the idea to get in touch with Cuteable about my felted goodies, and they responded which in turn became a feature for my needle felted flower pendants. If you are trying to grow your hobby into a business or just want more sales, it is vital to get your name out there for the recognition and free exposure. This means that you may need to take the initiative and spread the word yourself so don't be shy! Go ahead - send out a polite email or two and let others know about your quality handcrafted items. The worst that can happen is no response at all which is where you started anyway. And, not all of my features have been through contacting blogs and sites. Most of them come from those blogs and sites finding me first, but this is because I have a strong online presence and good product to offer. Essentially, it is a big marketing circle. Don't be afraid to reach out to site and blogs, but also do your best to have a good brand and online presence for them to find you too. Way to go! Your needlefelt flower pendants are so cool. That's GREAT that they are getting featured on cuteable. Thanks, also, for the great biz tip. Your blog is always so helpful and interesting! Congrats on the feature, that is fabulous! The pendents are beautiful, and I applaud your take charge initiative! You go girl!